Douglas McCulloch's latest article about Dartmouth Cultural Center appears in this week's print edition of Dartmouth Week and is online through Dartmouth Village Soup. Call for Teachers of All Types of Art & Crafts! Are you a professional artist or craftsperson? Do you have a passion for sharing your skills? Are you interested in leading classes or workshops? We have a place for you! Guest speakers and teachers of local traditional historic crafts are also invited! We've Been Selected for NOT YOUR AVERAGE JOE’S “NOT YOUR AVERAGE CAUSE” Program on April 11! Enjoy a delicious meal and raise funds for the Dartmouth Cultural Center, Inc.! The Dartmouth Cultural Center has been selected for NOT YOUR AVERAGE JOE’S “NOT YOUR AVERAGE CAUSE” program for Wednesday, April 11, 2018. 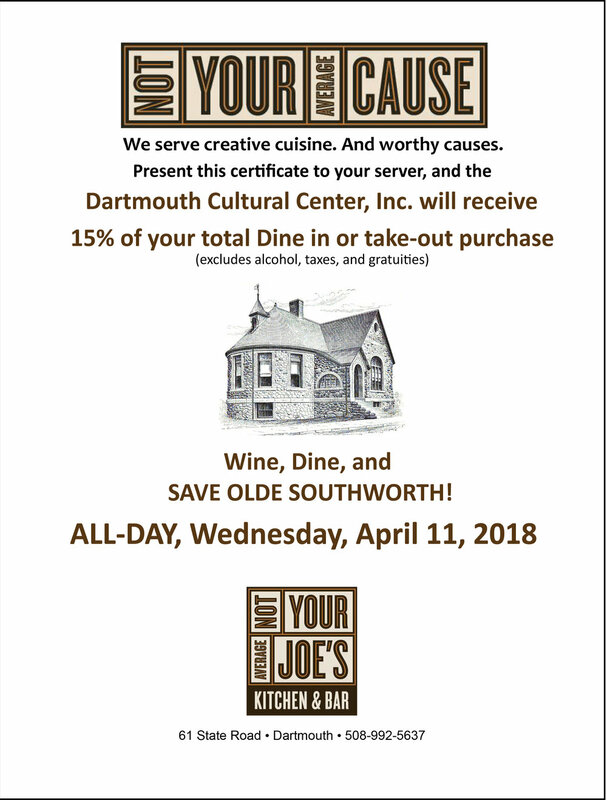 How it works: Throughout the day on April 11, Not Your Average Joe’s will donate 15% of all purchases made by Dartmouth Cultural Center supporters at Not Your Average Joe’s in Dartmouth. Dartmouth Cultural Center supporters identify themselves to servers with Not Your Average Cause certificates. The more Dartmouth Cultural Center supporters who participate, the more money Not Your Average Joe’s will donate to our cause! Our First Fundraiser Is a Success! The first fundraiser to save Olde Southworth went off without a hitch on Friday, February 9. We are so grateful to the many people who attended the event, who volunteered their time, made donations, and provided auction prizes. You made a difference! Read more about the event in Dartmouth Week! "Show Olde Southworth Some Love!" the fundraiser/friendraiser scheduled for Friday, February 9th at Valley Top Tavern at the Allendale Country Club is featured today in the Standard Times. Reserve your spot for this fun event featuring complimentary hors d’oeuvres, a cash bar, raffles and a silent auction and Phil Zukas performing on the keyboard. Tickets start at $25 and go up to $50 and $100 to include a donation for the night. Funds raised that night are set to go toward the cost to lease the 1,386-square-foot building, maintenance and utilities. Reserve your tickets here! Dartmouth Cultural Center wants to address any of our neighbors' concerns about rezoning. We understand your worries and do not want the proposed rezoning either. Our goal is to preserve and protect the wonderful atmosphere and longstanding building-use that has existed in Padanaram Village. We are working hard to protect Old Southworth Library and to continue its 129-year use: housing educational activities that serve the public on a small, human scale. This continuation of this type of usage will enrich the quality of life for Dartmouth residents, without any of the impact of commercial zoning or private ownership. Please help us get the message out! If you have been wondering about what Old Southworth Library looks like on the inside, now is your chance to visit. The doors will be open from 5:00 to 8:00 p.m. during Padanaram's Christmas Festival on Friday, December 8th. Please join us at 404 Elm Street, South Dartmouth, MA. Would you like a chance to see the inside of this historic building? Join us on Friday, December 8, at 404 Elm Street, South Dartmouth, MA. The building will be open to the public between 5:00 and 8:00 p.m. during the Padanaram Christmas Festival. Hope to see you there!